Happy 121st Birthday, Alberta Hunter (4/1/1895). She recorded as Josephine Beatty for Gennett with the Red Onion Jazz Babies. “Texas Moaner Blues” appeared on Gennett 5594 and Silvertone 4033. The track featured Alberta Hunter (vox), Louis Armstrong (c), Aaron Thompson (tb), Buster Bailey (sax), Lil Hardin Armstrong (p), Buddy Christian (bjo). 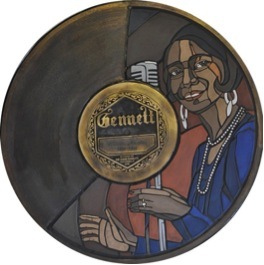 This entry was posted in April, Gennett, Gennett Walk of Fame, Video and tagged Aaron Thompson, Alberta Hunter, April, Buddy Christian, Buster Bailey, Gennett, Gennett Discography, Gennett Records, Gennett Walk of Fame, Josephine, Lil Hardin Armstrong, Louis Armstrong, Red Onion Jazz Babies. Bookmark the permalink.